At first glance, South Rupshi looks like any other village in the Bangladeshi countryside. Tea stalls line the roads, kids play in the mid-day heat. Rickshaw-drivers pedal their decorated bikes. But something sets it out from other villages. Everywhere, bundles of yarn are left to dry in the sun. People on their porches spin threads onto spindles, scarves flow in the wind. 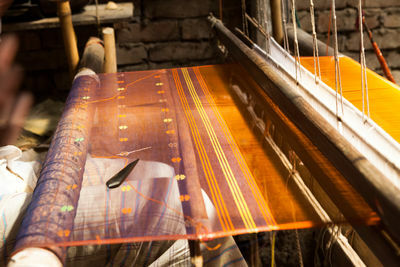 South Rupshi is the ancestral home of a proud tradition in Bangladesh: the age-old jamdani weaving. These days the village weavers are busy. 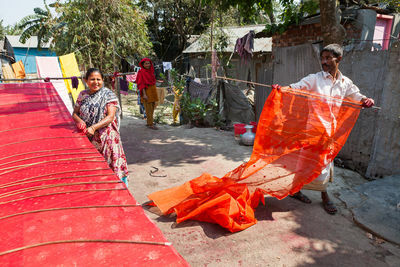 The demand for saris is growing, the handmade fabrics are sold to customers all over Bangladesh and India, and exported abroad. 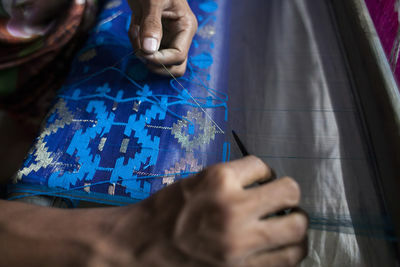 Last year, UNESCO declared jamdani an intangible cultural heritage, stating its importance in Bangladesh as “a symbol of identity, dignity and self-recognition”. But things used to be different. Only a few decades ago, traditional weaving was a forgotten heritage. Until sari entrepreneur Monira Emdad came and brought it back to memory. “In the early 80’s when traveling in rural Bangladesh, I came across hand-woven saris, more beautiful than I had seen anywhere else. 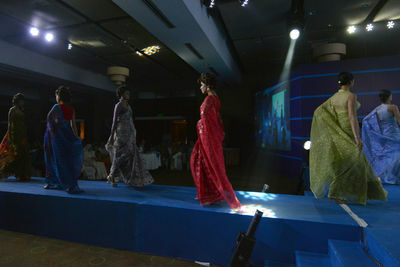 I started bringing them to Dhaka, selling them from a small tin shed,” she says. Her efforts started a jamdani revival, which has meant the craft is now passed down to the next generation – providing an alternative to a rural workforce which otherwise is pushed into low-paying jobs with unsafe conditions. “This is much better for us. We can stay in the village and work nearby our families. 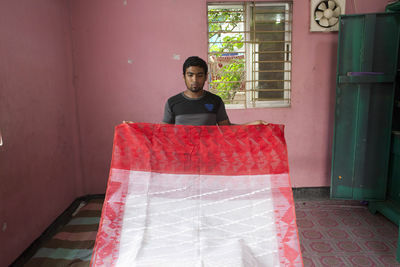 And it’s not dangerous, we only use our brains here,” says weaver Mohammad Azim. 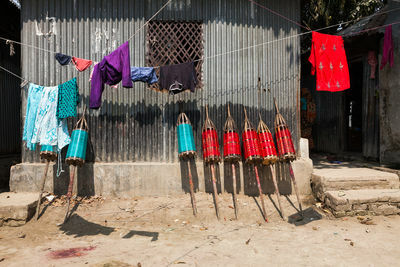 Colourful yarn outside a house in South Rupshi, a typical Bangladeshi village with dusty winding roads and simple houses built close together. 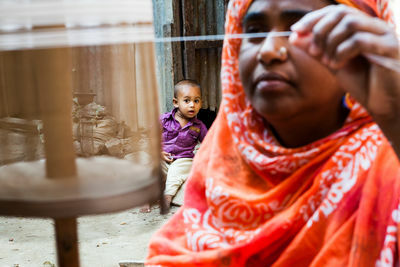 Mizanur, a weaver from South Rupshi outside Dhaka, working on a jamdani scarf. Jamdani is an age-old tradition, which saw its heydays during the era of Mughal rule. It was declining for a long time but is seeing a revival today. 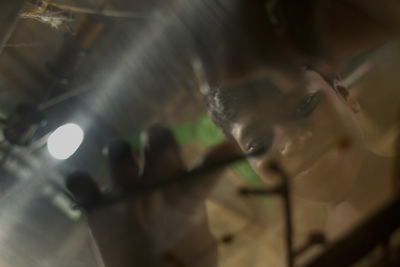 Mizanur, a weaver in one of the village workshops. 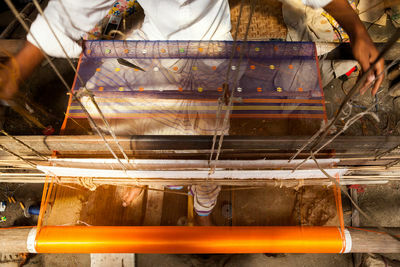 Each sari is commonly woven by two weavers, only small scarves are made by one person. 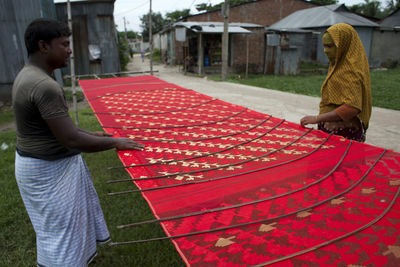 Two weavers in South Rupshi outside of Dhaka weave fine sari fabrics on traditional wooden looms. 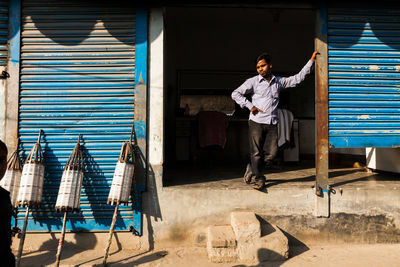 The craft, dating back to ancient times, is seeing a revival in Bangladesh and India. 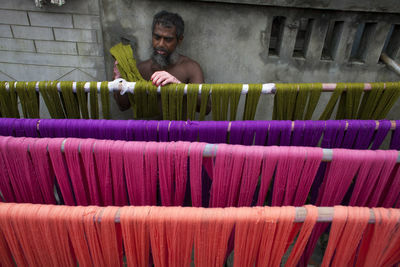 Mohammad Azim, a weaver in South Rupshi. 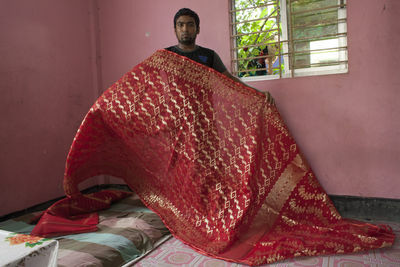 The sari he's working on is a wedding sari, in the traditional red colour. Wedding saris are the most elaborate, and the weaving is headed by a senior weaver with a younger apprentice by her or his side. 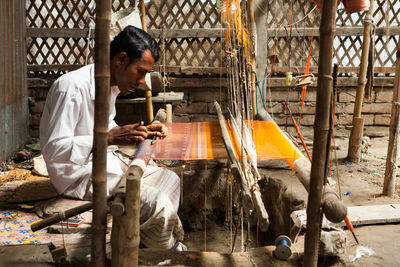 Almost all people in South Rupshi work in one way or another with jamdani weaving. 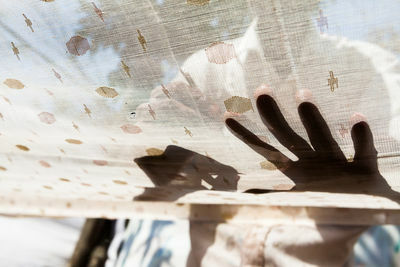 The man in the photo is taking care of an old sari, fixing small holes and stains on the fabric. He calls it "the sari dry cleaner". In a courtyard in South Rupshi. 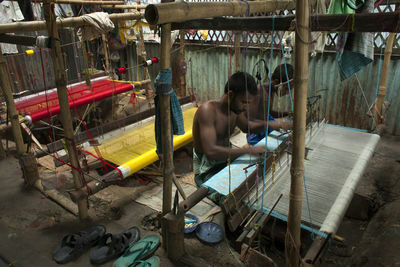 The women and the man take care of saris that people have used and want restored to a condition like new. To make the fabric crisp again, they wet it with a mixture of rice and water. 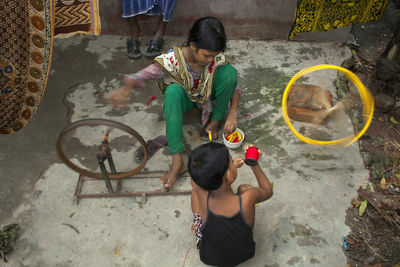 A small boy looks on as a woman spins yarn onto a wooden spindle in a courtyard in South Rupshi, outside Dhaka in Bangladesh. 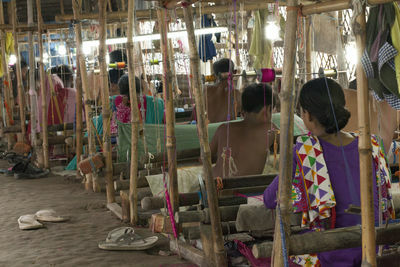 The village residents are involved in every step of the weaving process, from spinning and colouring the yarn to weaving the saris from start to finish. Alomgir and Sultana, brother and sister, work together on a white sari with golden decorations. 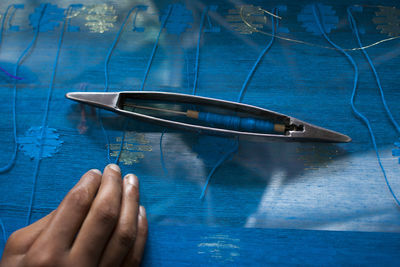 All saris are woven by two weavers, one senior and one apprentice. 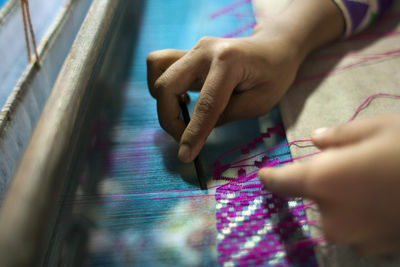 Jamdani weaving is a collaborative work. 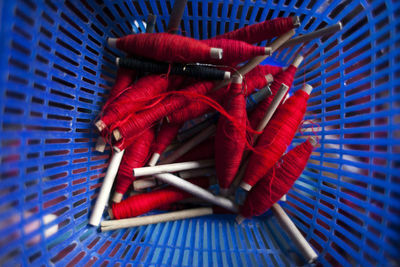 A weaver spinning yarn in the corner of a workshop in South Rupshi. 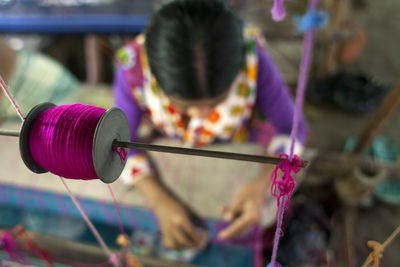 Many weavers work in their homes, other in simple shared workspaces nearby where they live. 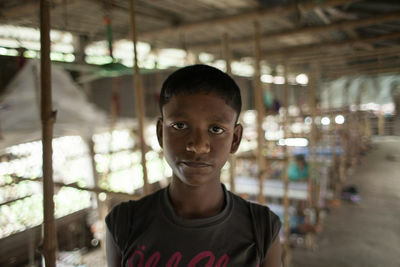 It allows them to stay close to their families, which many workers from rural Bangladesh cannot. 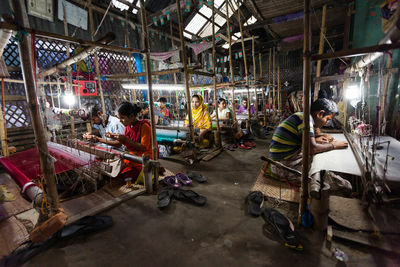 The option for many is work in the garment industry, which employs over 4 million people, mostly, women, but offers low wages and dangerous working conditions. Detail of a jamdani scarf woven on a wooden loom. The weavers follow no manuals, all patterns are made from memory. There are hundreds of symbols, many taking their names from things in the Bangladeshi countryside. 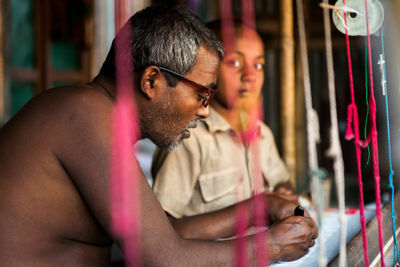 A senior weaver and a young boy. 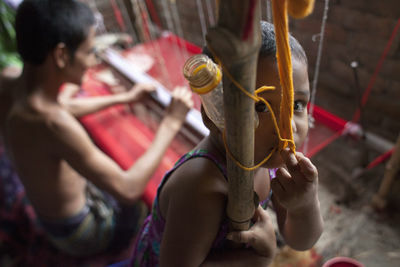 Traditionally, the knowledge of jamdani weaving is passed on to children when they are young. It remains like that today, but most children only weave after they have been to school in the afternoons. Weavers in South Rupshi working together in a shared space in the center of the village. 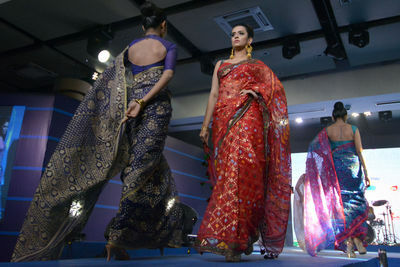 The saris are sold in Dhaka's most expensive sari shops, and exported abroad. 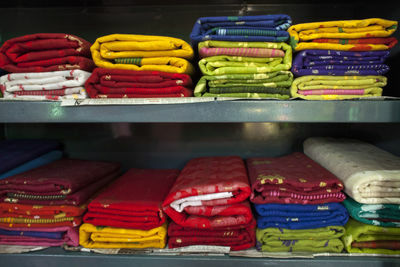 About 1/3 of the fabrics are sold to India, where saris are used for all kinds of occasions. On the street leading through South Rupshi, a weaving village outside Dhaka. The revival of jamdani weaving means that people can stay and work close to home, instead of moving to the city for work.